We have great pleasure in offering our reading a selection of Professor R. K. DasGupta's papers and speeches on philosophy and Philosophers  ranging from Dante Alighieri to Swami Vivekananda. Professor DasGupta is former Tagore Professor of Delhi University, former Director, National Library, Calcutta, and former Vivekananda Professor of Indological Studies and Research at this Institute. A profound scholar with a versatile mind, he is well-versed as much in philosophy as in literature. His studies of some of the great philosophers and their philosophies are brilliant. His lucid exposition of abstruse topics is remarkable. Readers will read these essays with profit and pleasure. We are grateful to Professor Radharaman Chakrabarti, Project Director, UNESC-IUHU Programme, RMIC, Gol Park, for writing an illuminating introduction to the book. The words that follow are actually written more as a tribute than a formal introduction to the selection of papers by Professor R.K. DasGupta, which is being presented in this volume. The lofty level at which Professor DasGupta's scholarship rests waits for no conventional introduction. At once versatile and highly specialized, he has been regarded as the teacher of teachers for several generations, myself being counted of course, among the less worthy lot. What prompted me to venture into garnering a few gems from the vast treasure house of his writing may be traced to particular trait in them which seemed to offer a strikingly new approach to study philosophers and their works. It makes a rare attempt to see philosophical legacy in the light of literary values with a humanistic appeal. Philosophers undoubtedly belong to the domain of metaphysical speculation and swear by the rigour of logical thinking. Yet there are some who can be seen as more than just philosophers. They distinguish themselves not merely by what they have said but the way they choose to say what they wanted to. Professor DasGupta's works are numerous and so wide-ranging that one can put them into many different baskets on the thematic link one like to find in each. Quite a good number of these are now available in print but many more, perhaps running into scores and scores, have yet to reach the reading public. For, many remain scattered as lectures delivered in universities, institutes of research and learned societies, apart from the variety of articles frequently appearing in the print media. The present collection contains just a few chosen on the thematic preference for that special literary approach to philosophical works, which is, remarkably, Professor DasGupta's very own. Even these selected few include certain papers which would have remained inaccessible, if not untraceable, unless they were made available in a handy collection like the present one. One other thing that needs mention like the present one. Treatment of the subjects he has written on. That helps one measure the perceived intellectual distance or propinquity between the perennial Indian thought and the ideas enunciated from time to time by the leading lights of the West. Measurement here is essentially qualitative, not confined to tracing merely the similarities and parallels of configuration, but getting at the very roots of realization which tend to bring the East and the West face to face. It is at this point that comparability assumes a new meaning to be worked out by the enthusiastic reader  a task made enjoyable and rewarding as one goes through those wonderful passages that mark Professor DasGupta's writings. It would took as through the Professor was anchoring a dialogue between the East and the West, with the followers on the both sides becoming more and more enlightened at every turn of his arguments. Towards the end, however, we reach the culmination of the entire discourse in two illuminating expositions on Indian Philosophy and Swami Vivekananda's Neo-Vedanta. In 'Dante and Aquinas', the readers including the informed ones would be stuck by the deft handling of theology, philosophy and poetry presented as the sustaining spirit of the two mediaeval European prodigies. Undisputedly, for its validation religion needs a strong intellectual foundation  a rare asset for any religion to become more than a faith. It is this rarity that Professor DasGupta emphasizes when he finds 'how neatly and competently Aquinas acted as a bridge-builder between Judaic Christian legacy and that of Hellenic metaphysics'. God is seen here as larger than what a believer or a nonbeliever makes of Him. This is where reason and revelation merge and irresistibly beckon the poet in Dante, for, poetry and philosophy ought to combine so that conceptual vastness finds completion in an intensity of feeling. This is not, as the Professor cautions, merely mixing philosophy with poetry in the ordinary sense of the terms. The Professor also discovers for our benefit the common ground covered by the philosopher and the poet in the social sphere, as they tend to establish an ethical order and want ideas to be harmonized for the sake of good life. We need that kind of attitude so much today; for, our times are no less strife-torn than the troubled times of Dante and Aquinas. 'Hegel's Philosophy of History' is visibly the shortest and yet a quite engaging piece in this collection. We learn that the concept 'philosophy of History' descended from Voltaire's article on History included in Diderot's Encyclopedia and was anticipated fairly early in the writings of the leading German philosophers of the eighteenth century. Since reason to Hegel in not human reason but 'God's purpose on earth', the language of religion thus makes an entry into the zone of social thought. Sections of liberal secularist thinkers may have their reasons to resent this 'intrusion'. But on an honest probe, the fault would appear to lie not with the language of religion as such but the unreceptivity and non-neutrality of the politico-social domain toward values that originate outside that domain. The sinister use to which these values are subjected in the social sphere is everybody's knowledge of course. Hegel was least disturbed by the possible evil designs of posterity. As Professor DasGupta so convincingly points out, Hegel looked upon 'polity' as something more profound than a mere constitutional fabric. He wanted the State to manifest the divine essence and this is a challenge before every organized political community to date. If this appears to be too idealistic to conventional thinking which finds comfort in the Marxian reversal of Hegelian position, then there is a sound piece of advice from Professor DasGupta: 'to disengage Hegel's concept of the idea as an active principle in history from Marx's Dialectical Materialism'. Who also would dare to be so outspoken? For who else would find in Hegel's work 'a document of hope for mankind'? History enlivens men when viewed as purposive, not just phenomenal. With equal intrepidity, Professor DasGupta goes beyond conventional appreciation of Schopenhauer in whose melancholic philosophy he finds a deep human passion. He regards him more as a 'literary artist than the founder of a metaphysical system'. Deficiency, if any, in Schopenhauer's academic physics was more than compensated by his human interests that made him as much of an a artist as a philosopher. For, he looked at man from what ordinarily passed for 'irrational' action and passion. His reaction against mainstream German rationalism was aimed at saving man's existence from stunting rationality. And, according to Professor DasGupta, that reaction, therefore, was 'important more for its literary than philosophical consequence'. Who else but Professor DasGupta could object to Bertrand Russell's oblique tribute to Schopenhaur's work as 'amounting to some disservice to a great genius'? And, was it not unique of his philosophy that Schopenhauer wanted to intensify the moral concern of people by intensifying their sense of sorrow? Professor DasGupta not only recognizes this but finds in his thoughts 'the full unbiased eye of Art'? For, 'philosophy has to be intelligible and not without beauty'. The other aspect of Schopenhauer which catches the discerning eye of Professor DasGupta concerns the importance he attached to intuition which one needs more than conventional rationality in order to comprehend Reality in its inner substance. With his characteristic alertness, he emphasizes the remarkable correspondence between the Hindu notion of maya and Schopenhauer's ideas of the world as an 'appearance' with the human 'will' underlying it as the reality. At the same he is quick to point out that the 'will' of Hindu spiritual experience does not curse human existence to a 'common doom' but permeates human consciousness so that man could, if he tried, come closer to divinity. Here is an element of exertion, an active pursuit in which Schopenhauer might not have found much value. This was because he believed in 'deliverance through Art', an escape from the turmoil of existence through contemplation. To him, the world of art is 'a world contained by the impurities of the world of will'. Hence, he talks not of suspension but 'extinction of the will', presumably a distant echo of the Buddhist doctrine of nirvana. Since human misery is largely rooted in man's own folly and also in the maladjustment with his social surroundings, it would be pertinent to probe that segment of European speculation which grew as Social Philosophy. Auguste Comte, the nineteenth century French social philosopher stirred the imagination of many an illustrious intellectual of this country with his positivist philosophy, foremost of them being Bankim Chandra Chattopadhyay. Here, however, Comte spears in a different and yet equally through-provoking role, with an absorbing discourse on the Ethics of Human conduct. This is as it should be. For, Comte viewed social dynamics as contributing to 'the development of our noblest dispositions and our most generous feelings'. The fundamental direction of human development, according to him, is to be found in the growing ascendance of the altruistic over the selfish passions. His maxim was 'live for others'. Hence as a cognate element of social progress he earnestly advocated introduction of what he called the 'religion of humanity'. In this latter faith Comte equates divinity with humanism. What does moral thinking have to do in upholding this humanism? The answer, as Professor DasGupta points out, is that 'the creative intellect of the moral thinker has to be sustained by the moral urges of men of high social intent'. It is this 'moral energy' that helps rebuild society and thereby gives man new hope for a better existence. Morality in this context becomes a part of the larger question of social reconstruction. No doubt at a mature stage of his life Comte permitted himself into mystical leanings. In doing so he was not actually running away from the scientific foundation he had built for his thought structure. That becomes evident if, unlike many of his contemporary critics as well as admirers, one can trace the link between his positive Philosophy and his religion of Humanity. This very valuable task has found expression in Professor DasGupta's paper on the Ethical Ideas of Auguste Comte. Here again the Professor pecks up 'the poetry of a rational humanism' but cautions the reader that this new notion of religion was 'independent of theology' and 'based upon a clear perspective of social science'; in other words, Comte was not theorizing. He was learning on the fact of human experience. In Professor DasGupta's estimation what distinguishes an avid philosopher is the unique ability to combine literary excellence with high speculative faculty  a quality which he finds in an admirable measure in the writing of Bertrand Russell, whom he adores as the writer of 'literary prose'. He is quite convincing in his rejection of a segregationist view of intellectual work and denounces creation of the stuffy 'academic pigeon holes', which are a stumbling-block to the much needed integration of the liberal arts. There is no reason why the rational and the intuitive have to be separated. For, there can enough room for poetry in philosophy and vice versa. Reason and emotion need not be regarded as mutually repugnant. It is in a perfect blend that the two can be seen at their best. A matter of rejoicing, therefore, it is to find in Russell 'a philosophy of metaphysics, which bring it very close to mysticism and poetry'. Particularly striking in this congruence, as Professor DasGupta's appreciation shows, is that philosophy gave Russell his 'care for style', which is why Russell's writings on history of philosophy contain so much of 'lively fancy'. His style unveils a special prose form, so much useful for any philosophy to be expressive as well as adored. Professor DasGupta, however does not miss a regrettable deficiency in the entire gamut of Russell's work which shows a relative indifference to those elements in Indian philosophy which, in Professor DasGupta's inimitable words, are 'a metaphysics distilled from tears such as angles weep'. He, therefore, not only appreciates but also demands the 'real value' from creative minds. What do we mean by 'real value', when it comes to philosophical discourse? Easy to ask but different to concretize. For a clue we must turn to Professor DasGupta's own reading of the spiritual approaches to philosophy as enshrined in the Upanishads. The few pages we find in a lecture synopsis on this subject are pregnant with significant ideas that would guide one into the world of Upanishadic reality. Connected with this is a critical discourse on vedantic monism often misunderstood by commentators both Indian and overseas as too rigid to leave any room for diverse spiritual relations with the Supreme Being. 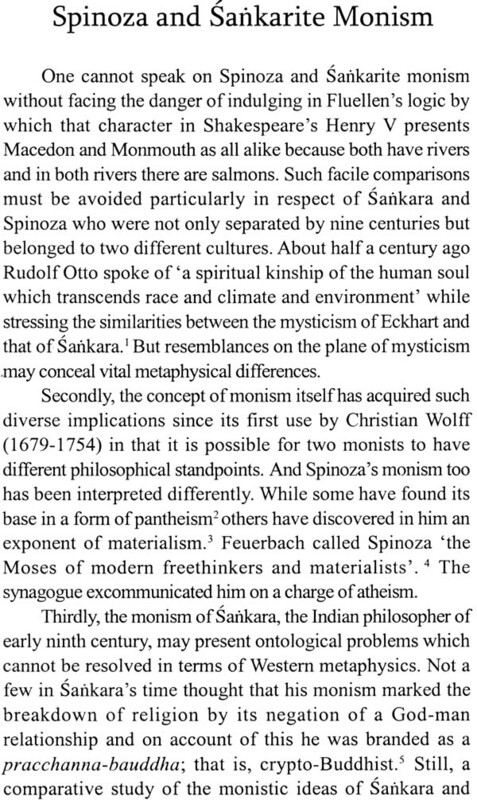 His remarkable piece on 'Spinoza and Sankarite Monism' discards at the very outset of tendency to attempted facile and superficial comparison. Instead, he wants to delve deep into the fine distinctions of the monistic system that is embedded in the religio-ethical ideas of the two. Both are directed to negate the supposed duality between God and His creation. Yet the differences of the two thought systems are manifestly fundamental, both from substantive and contextual viewpoints. Of these specially mentionable is the metaphysical implications of treating God as the substance with abundant attributes which leads Spinoza into the notion of 'divine causality'. To a Sankarite monist whose idea of the Absolute is nirguna, this simply does not make sense. After all Brahman cannot be the cause of empirical reality which a Sankarite would regard as basically 'unreal'. But the crux of the matter arises when one ponders about the coexistence, not inert but interactive, of two such vast incompatibles as the real Brahman and the 'unreal' world. At this point Professor DasGupta introduces a brain teaser: 'if monism is possible' when both Sankara and Spinoza have unwittingly introduced and, therefore, are required to cope with duality. The discerning reader would see how deeply interesting can be the arguments surrounding the supposed duality of the 'unlimited' and the 'limited', though in spiritual vision they must be inseparable. Incidentally, one would also notice that this is one of those rare pieces where the Professor is not drawn, as he is elsewhere, into the compelling attraction of literary beauty which must inform all creative philosophy. Perhaps that could be due to the bewildering depth of spiritual perception with which theology somehow gets mixed up, obscuring the beauty we ordinarily seek. An act of clearing up is therefore very much in order. This the reader will get in the Professor's short but pithy exposition of the Indianness of Indian philosophy in the light of Vedantic wisdom. Here both theistic and non-theistic approaches to get at the relation between the being and the Super-being have received an appreciably fair treatment. The problem that arises from an unavoidable tension between dvaita and advaita, between the notions of the 'only permanent Being' and the 'many transitory Manifestations', is quite baffling and hence the troubled choice between devotion and meditation deserves a comprehensible solution, if not conclusive and final. This we get from the interesting soliloquy taken from Christopher Isherwood's Vedanta for the Western World. Tragic though it is, more people in the West today are curious about Vedanta than here in our country where it originated. What has happened with the present day Indians is not simply an ill-digested overdose of Western materialism but a strange inertia that has gripped the average Indian mind. Over and above there is the calculated aversion to an indoctrinated intelligentsia toward exploring one's valued heritage, with the result that the 'Wonder that India was' continues to be written in the past tense. Stranger too are the excuse for not doing even the minimum to muster that little will to reflect on, far less achieve, that emancipatory spirituality which has been India's greatest gift to humanity for ages to come. The general escape route for such unthinking people is to believe that the path of the Vedanta is meant for the Sages and the Spiritualists, thereby making a docile acceptance of an ever unhappy meaningless existence. Thankfully, there is a remedy and that has come from none other than the one great sannyasin who could give each one of us a wake up call and make each one of us see that the principles of Vedantic self-realization are eminently practicable even in our multifettered ordinary lives. Hence is the inclusion of the last two lectures of Professor DasGupta (delivered just about a decade back at the Asiatic Society, Kolkata) on Swamiji's enunciation of Neo-Vedanta. In this selection we have included a perceptive essay on Max Muller presented as an Indologist. Admittedly, India owes a lot to the precious contribution made by this scholar extraordinary in mediating between the timeless intellectual heritage of India and contemporary European scholarship. But there is a much more persuasive consideration which explains inclusion of this piece. Max Muller is presented here as 'essentially a humanist' with all the distinguishing marks of a true 'Renaissance Scholar'. Such a scholar alone could go into the heart of India's philosophical tradition embedded in the sacred books of the Vedas and the Upanishads. What Max Muller did amounted to an act of internalization without which dissemination of India's cherished wisdom to the Western audience might have fallen short of a certain consummation. So keen he was 'to perceive higher truths' that his worthy Indian friend Radhakanta Dev admitted how he would look forward to his German friend rising one day 'to the rank of a Veda-Vyasa (revealer of the Veda) of the Kali-Yuga'. And why not? Which European scholar has ever felt like 'being always in Benares' so soulfully without ever visiting the sacred city? Max Muller, literally speaking, was not a philosopher. He did not belong to any specific school of philosophy. He did not have to, for he easily partook of the most soul-satisfying philosophy of the East and transmit it to the rest of the world. In fine we may say that we have tried to piece together some original and unique elements in Professor DasGupta's analysis and appreciation of some of the finest thinkers of East and West. The compilation is focused on a singular and, surely, a splendid aspect of the learned Professor's musings. It reveals for benefit of the present generation and also posterity the great value that philosophy can generate when it absorbs literary beauty of the first order. Philosophy here parts with its academic anchorage and rises high into the realm of bliss on the wings of what may be called the 'poetry of humanism'. Born in Calcutta on 11th July 1915, Rabindra Kumar DasGupta obtained his MA in English from the University of Calcutta. In 1958 he got D. Phil. From Oxford, where his research paper was titled 'Milton's Theory of Poetry'. A man of immense erudition, possessor of a superb analytical mind, with vast knowledge of western culture and philosophy, he took up the challenging task of reinventing the greatness of Indian culture based on spirituality minus any form of religiosity. He could easily make comparative study of Sankara's philosophy with that of Spinoza, analyse how Christian religious philosophy of Thomas Aquinas influenced Dante, re-evaluate the role of the French philosopher Comte's theory of positivism while discussing 'ethics' and 'morality'. He is an Indian with a world-mind who always endeavoured to bring harmony between the Eastern and Western thought process. He is an intellectual who uses his scholastic knowledge only to focus on the moral and ethical aspects of humanity in the truest sense of the terms. His career as an academician began when he joined the Post-Graduate Department of English as a teacher in the University of Calcutta (1938-45). He soon become the reader in English, Saugar University (1947-48), Professor of English in Hindu College, the University of Delhi, and was back as the Reader in English, first in Jadavpur University (1958-60) and then in the University of Calcutta (1960-62). For the next twelve years (1962-77) he was the Tagore Professor of Modern Indian Languages in the University of Delhi. He retired as the Director of the National Library of India (1977-80). He was a member of the general council of Sahitya Academy (1968-72) and the Vivekananda Professor of Indology at R.M.I.C. (1980-2004). During his long illustrious career he was the recipient of several National Awards, the chief being Kalidas Nag Memorial Model (1991), Sharat and Rabindra Purashkar and the Deshikottama (2006) of Visva Bharati. He also served as an executive committee member of the International Comparative Literature Association and Canadian Review of Comparative Literature. The lofty level at which Professor R.K. DasGupta's scholarship rests, waits for no conventional introduction. At once versatile and highly specialized, he has been regarded as the teacher of teachers for several generations. 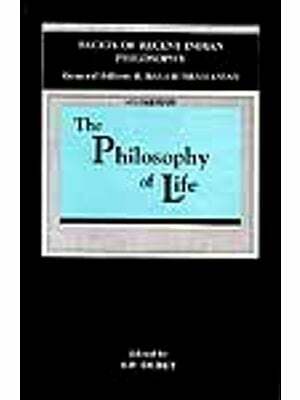 What prompted us to venture into garnering a few gems from the vast treasure house of his writing may be traced to a particular trait in them which seemed to offer a strikingly new approach to study philosophers and their words. It makes a rare attempt to see philosophical legacy in the light of literary values with a humanistic appeal. Professor DasGupta's works are numerous and so wide-ranging that one can put them into many different baskets on the thematic link one likes to find in each. Quite a good number of these or now available in print but many more, perhaps running into scores and scores, have yet to teach the reading public. The present collection contains just a few chosen on the thematic preference for that special literary approach to philosophical works, which is, remarkably, Professor DasGupta's very own. Even these selected few include certain papers which would have remained inaccessible, if not untraceable, unless they were made available in a handy collection like the present one. One other thing that needs mention here is the author's treatment of the subjects he has written on. That helps one measure the perceived intellectual distance or propinquity between the perennial Indian thought and the ideas enunciated from time to time by the leading lights of the West. It would look as through the Professor was anchoring a dialogue between the East and the West, with the followers on both sides becoming more and more enlightened at every turn of his arguments. Towards the end, however, we reach the culmination of the entire discourse in two illuminating expositions on Indian philosophy and Swami Vivekananda's Neo-Vedanta. weight of book 379 gms.